Inside The Nannup Clock Tower, you’ll see a six-metre high timber pendulum clock, the largest of its type in the world. The clock face is visible from the outside of the building, but the beautiful inner workings are only visible from the upstairs interactive display area, where visitors can get close enough to smell the fragrant wood and hear the click, click, hum of the gears, but not close enough to touch the clock and risk disturbing it’s perfectly balanced rhythm. If you’re lucky, you may get to see the self-winding mechanism turn over, which happens just twice in every 24-hour cycle. 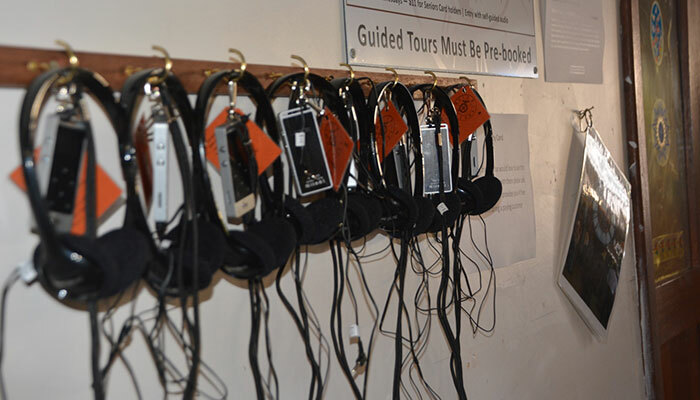 Visitors have the option of being accompanied on their journey through time by our self-guide audio track, one of our knowledgeable tour guides or the clockmaker himself Kevin Bird. Our clockmaker’s passion for his craft spills over in the stories he shares about his journey through time, and the creation of our beautiful clock. 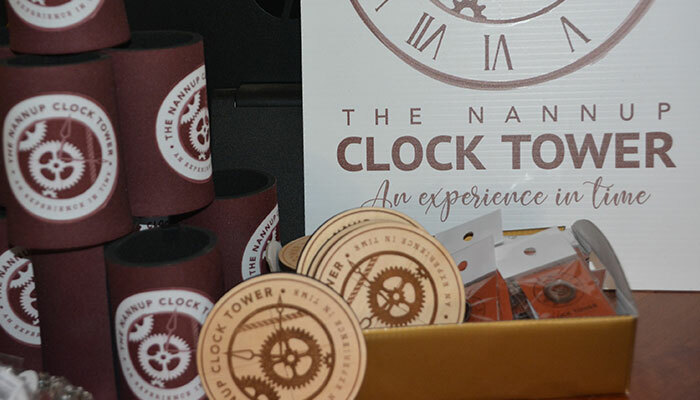 There are a few different ways to explore The Nannup Clock Tower and the town of Nannup. 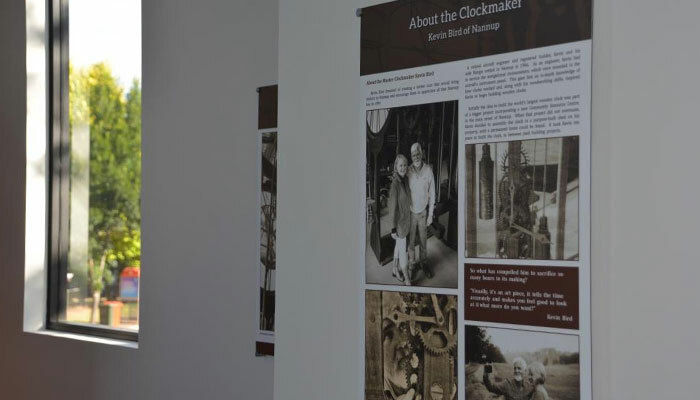 Entry to The Nannup Clock Tower includes an audio guide to An Experience In Time, an exhibition of all things related to time, clocks, wood and Nannup including access to the world’s largest wooden pendulum clock, standing at an impressive 6m high. The clock is made almost exclusively from timber sourced in the local forests and lovingly assembled by hand over a period of 10 years. Discover the story behind this incredible achievement from the clockmaker himself in an interesting and informative audio tour. For groups of 6 or more, guided tours of the clock and An Experience in Time exhibition can be booked with one of our experienced guides. Hear about the creative process involved in designing and building the clock and see the self-winding mechanism in action. With our clockmaker Kevin Bird as your tour guide, explore the Experience in Time exhibition and get up close to the 6m high pendulum clock. Not only does Kevin have a wealth of knowledge about the history of clocks, he’s also a great storyteller. One of his favourites is the story of this clock and how it came about. Hear about the creative process of designing and building a clock and see the clock winding mechanism in action. Take a stroll back in time and be guided on a journey through Nannup’s past. 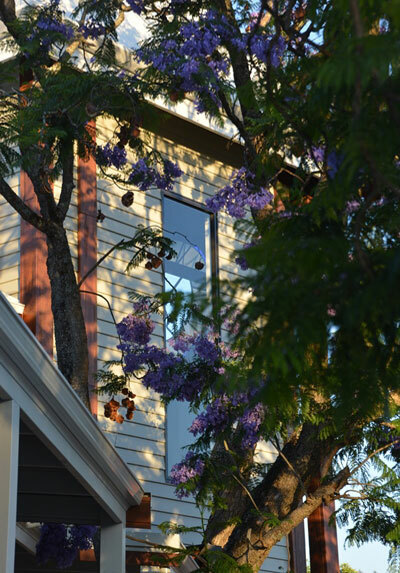 Nannup was the first inland settlement in the South West to be declared a town and it’s proud of the fact that many of its heritage buildings are still intact. Your guide is a Nannup local who will take you on a fun and interesting exploration of rural Australia’s past where you will learn about the role of convicts, agriculture, timber, railways and of course the mysterious Nannup Tiger in shaping Nannup’s unique story. The tour starts at the Nannup Visitors Centre on Warren Rd. This tour is conducted at a gentle pace over mostly level ground and will suit visitors of all ages and abilities.